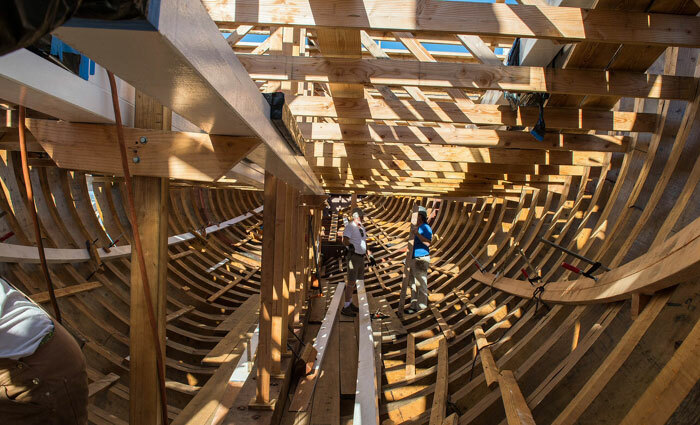 SAN DIEGO — Children and adults are invited to play a part in building a replica of the first European boat to visit California — San Salvador — during the Ancient Mariners Sailing Society and Maritime Museum of San Diego’s ship building event, July 13. For one day, family members can work side-by-side on the historic vessel, under construction at Spanish Landing. Novices and boat building experts are welcome to join in the eight-hour event, where they will have the opportunity to work directly with the museum’s master shipwright Mark Montijo and two lead carpenters on actual construction projects. “This event will engage the community at large, and hopefully some of the adults will be coming back on their days off, to help more regularly,” said Montijo, who also serves as vice president of the Maritime Museum of San Diego. The public event is aligned with the Ancient Mariners Sailing Society mission, to educate the public about ancient boats and boat woodwork. Both elements are important to the preservation of the wooden boat heritage. For the past 10 years, the group has hosted a family boating day that allowed people of all ages to built a 12-foot skiff and then launch their creation into the bay. This year, the group is giving the public a chance to work on a replica of ship that was sailed into San Diego Bay in 1519 by Portuguese explorer Juan Rodriquez Cabrillo. “San Salvador will be launched next year, so this was the only chance for us to get families to work on the boat,” said Jerry Newton, board member of the Ancient Mariners Sailing Society. Volunteers will don construction hats, gloves and other gear, and will craft timbers to be placed on the ship. Kids and grownups will be involved in numerous hands-on woodworking projects. Newton will be on-site, lending his personal wood boat building talents to the occasion. This will be his first time working on a boat of this size and significance. However, prior woodworking experience is not required. Those with carpentry experience will be given more complex tasks, while newbies to boat building will be handed less difficult jobs. Approximately 70 percent of the on-land portion of the vessel’s construction has been completed. Once finished, San Salvador will spend close to six months in the water undergoing Coast Guard inspections and sea trials. About two-thirds of the workforce on the project is composed of volunteers. The board of directors of the Ancient Mariners/Maritime Museum Educational Fund, will accept individuals and families up to the first 25 participants. Applications are available at the Ancient Mariners Sailing Society website: amss.us. Completed applications and donations may be sent to: Ancient Mariners/Maritime Museum Education Fund, c/o AMSS, P.O. Box 6484, San Diego 92106. Special accommodation will be given to families.